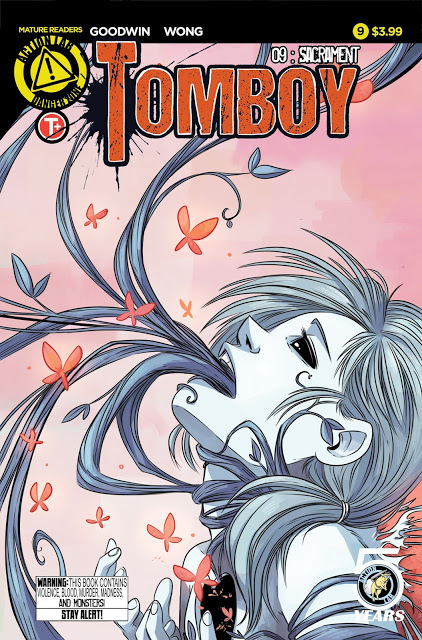 Through eight issues, 'Tomboy' has proven to be one of the comic book industry's best supernatural thrillers featuring a young girl possessed with mysterious deadly powers. The origins of which hadn't been revealed. In the midst of a bloody trail of revenge, Addison (and we) learn where these powers came from. Issue nine is a game changer providing answers to questions that have lingered since the beginning. Mia Goodwin has held on to the full story behind Addison's otherworldly vengeful displays of grisly retribution for a long time. So smartly written and riveting, 'Tomboy' didn't suffer from lack of origin details. While some comics divulge everything within the first arc, Goodwin wasn't in any hurry to give readers the full scoop which kept things steeped in mystery. There have been hints of it being some sort of ancient curse but the truth is much more poetic and expansive than that. Without giving too much away, the ability to "speak" to the dead and perforate the human body with vicious tentacles comes from a particular lineage, descended from previous generations. It's origin or its mythology is otherworldly indeed but not the only strain that exists. It opens up a vast underground world of warring factions, of betrayals and long-standing vengeance. The reveal is an absorbing stream of exposition that is beautifully illustrated by Michelle Wong. Since Wong took over the art duties from Goodwin she's not only kept the anime-inspired look but improved on it issue to issue. Her fantasy elements emerge smoothly from each scene, never clunky or awkwardly, they spring up with subtlety at first before expanding into jaw-dropping designs. Evoking different emotions from a character is a mark of a good artist and Wong's excellent emotional arc for Addison is especially transcendent. Confusion, anger, frustration, sadness are all part of Addison's story as she deals with the horrific consequences of her powers. It's in high contrast of her conversation with Jessica who's flippant, joking, and snarky. There's genuine and appropriate feelings being expressed by the characters. The subplot with Detective Autry and her backstory is also handled extremely well adding a lot of relevance to the present day and main plot. I don't know if I can shout any louder that 'Tomboy' is one of the best comics currently in print. Issue nine exemplifies all that makes it so good. The dark bloody nature of the series coupled with thoughtful and creative storytelling. Goodwin rewards fans with the origin of Addison's powers and opens up an entire new set of circumstances going forward, adding layers of discoveries to digest. It was so good I read it twice. Do yourself a favor and pick up 'Tomboy' now.